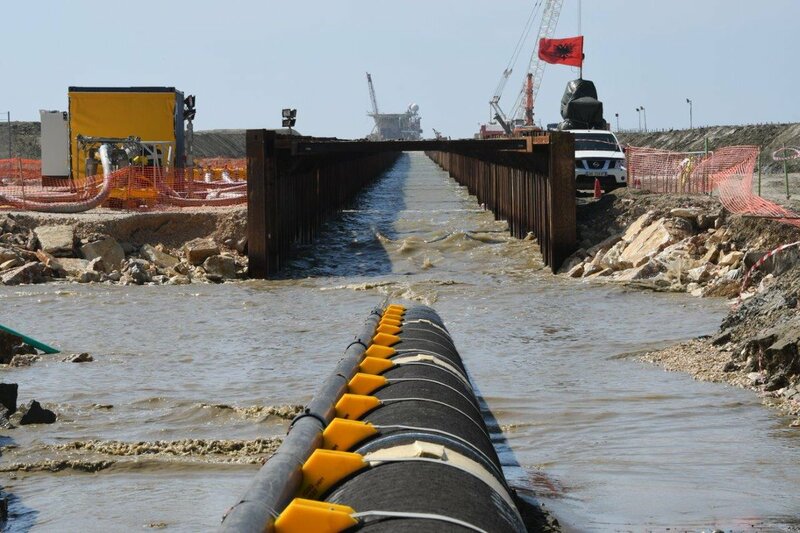 A further step has been taken towards the completion of the TAP gas pipeline, with the placement of the first undersea section of the pipeline in Albania and its connection to the land section of the project at the town Fier. The tubes were “joined” aboard Saipem’s Castoro 10, 1.4 km from the beach. The welds were then tested and the pipeline was placed at the bottom of the sea. At the same time, the laying of the 139 meters long and 36 meters wide pipes continues at a shallow depth near the Albanian coast, in Albanian territorial waters. The consortium managing the TAP gas pipeline commenced construction work on the underwater section in October 2018. The coastal part of the TAP gas pipeline, connecting the Albanian and the Italian coasts, is 105 km long. The pipelines will be located at the Adriatic bottom and the distribution is as follows: 37 km in Albanian territorial waters, 25 km in Italian territorial waters and 43 km in international waters. The deepest point of the TAP gas pipeline will be 810 meters below sea level.